ENGINE 11HP. HONDA WIDTH OF CUT 24" TRANSMISSION:3 FORWARD; 1 REVERSE. WILL CUT SAPLINGS TO 1 1/2" THICK. CUTTING HEIGHT APPROX. 3". 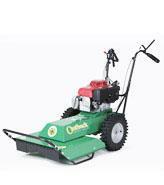 THIS UNIT IS DESIGNED TO CLEAR AND MAINTAIN NON-MANICURED LAWNS..